Centerlock vs. 6 Bolt: Which One is Better? While other people drive normal cars on normal, smooth roads, you prefer going on challenging drives. You love taking a ride on those rough terrains that make you sweat and make you feel invincible, don’t you? However, the tougher the road, the tougher your ride should be. That is where ATV or All-Terrain Vehicles enter the picture. With ATVs, you can cruise through any kind of terrain you face in the most badass ways. What mainly differentiates ATVs from other vehicles is their tires. Tires are somewhat the only part that comes in direct contact with the road and is responsible for handling it. Therefore, you need to periodically check that your ATV tires are working well and not getting too old. In case they are getting old, you have to immediately replace them not only for better performance but for preventing accidents. But, choosing ATV tires is a very tough and confusing task. 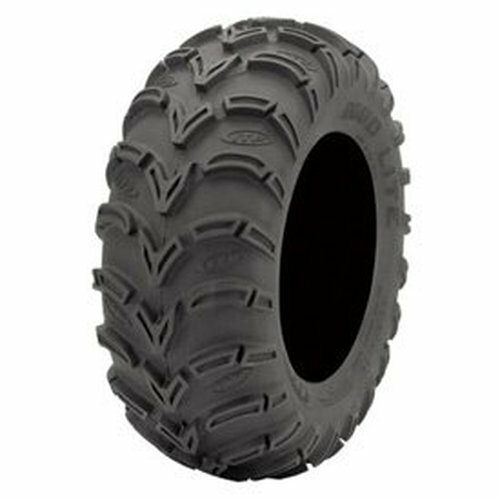 You have to choose the best ATV tires to help your ATV perform its best. Our aim is to make the task easier for you by simply informing you about all the things you should consider. 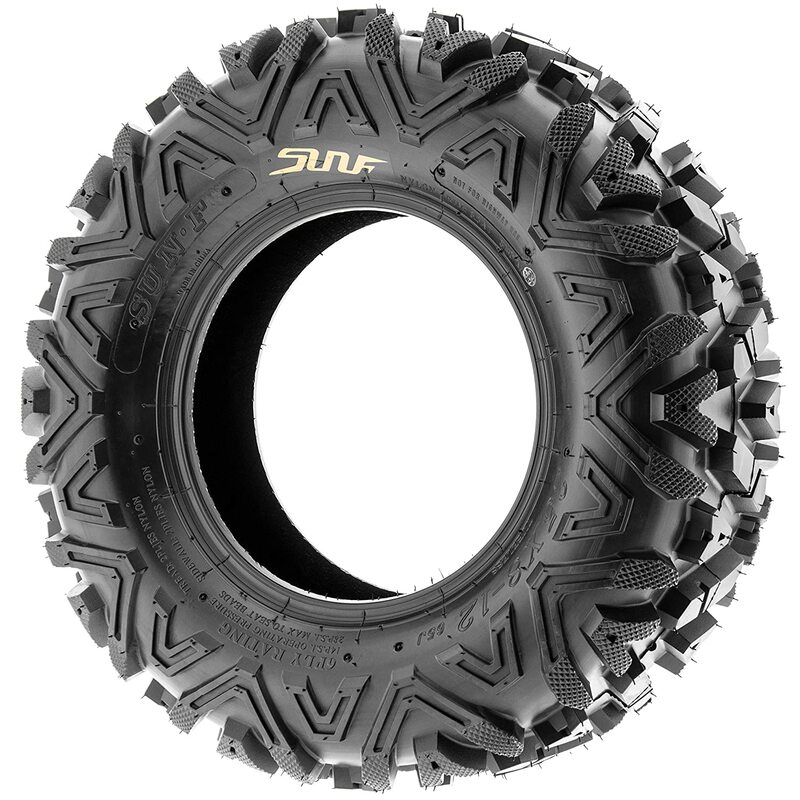 Moreover, we have also included reviews for the five best ATV tires that you can choose from. People do not wear heels for morning walks or jogging. Similarly, you cannot use one kind of ATV tire for all kinds of terrains. Before start looking for the tires, narrow your choice down to the kind of tires you actually need for your purpose. Now, here is a full guide to help you do that and also choose the best ATV tires. 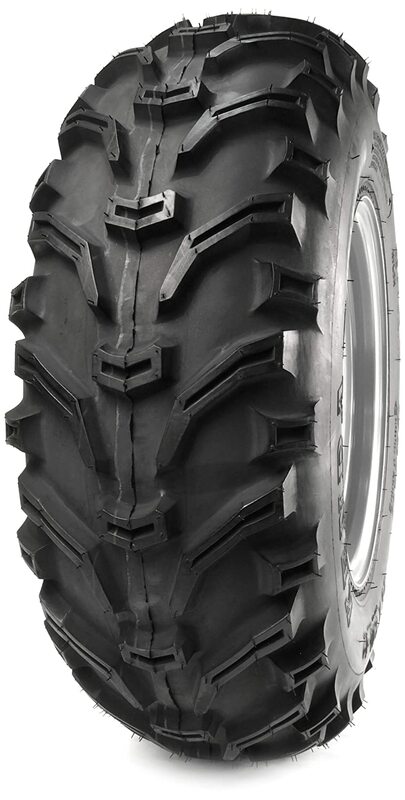 You can basically choose from two kinds of ATV tires – Radial and Bias. Bias tires are built for tougher terrains. They have tires with such designs that they can easily dig in and easily cruise through rough, uneven terrains. Their treads have deeper and more frequent lugs for better control and traction. Moreover, as they are built for bumpy terrains and steep hillsides, they provide the rider with a bumpy ride on smooth roads as well. Although the treads wear out very quickly, punctures are easier and cheaper to repair for bias tires. But, as they need to be more effective and energetic, they need more fuel than radial tires. Radial tires, on the other hand, are suitable for smooth and fast riding. As with smooth road, the challenges decreases, radial tires last longer than bias ones. That is if maintained properly. Moreover, they need less fuel as well. They provide a smooth ride but cannot deal well with steeps and uneven terrains. Moreover, as they are made for smooth roads, they are more susceptible to punctures. And, the cost of repairing is higher in this case. As you do not want to get into trouble, you have to use the right tires for the right terrain. In fact, ATV tires differ in their designs for use in various terrains. You should be aware of which kind of tire suits the terrain you frequently cruise on. The name might make you think that it is great for both smooth and steep roads. But, no. Yes, you can use it on both smooth and uneven roads but not on anything like a steep hill or other extremely challenging terrains. You can cruise through a forest to get to a highway maybe but not through a desert. These tires are designed to handle smooth roads and a few uneven roads that come alongside with the smooth ones. Being carefully made from more durable materials to withstand the pressure, these tires have hybrid tread patterns that suit both the smooth and the rough. If you have to go through uneven roads with lots of dirt, gravel, rocks, roots, etc. often, these tires are good for you. While All-terrain tires favor both the smooth and uneven, off-road tires specifically favor the uneven. They have deeper lugs in them to survive the uneven roads. Moreover, with their durable design, they can also cruise through the sand and mud that comes with the uneven. You definitely need specialized tires for cruising through sand. Sand with its instability can give you a hard time with your ATV. Therefore, sand tires are specially designed with more paddles. Moreover, the front tire needs to be slicker and the rear more beefy to provide better control while riding sand dunes. If you want to use these tires, know that they will not give you a smooth ride on smooth terrain with its design. They are designed with larger knobs so they can remove mud and snow from the way and proceed forward slowly. They are built with more durable materials so that they can withstand sudden, rough impacts. As the name suggests these tires are made for racing. They are made extra durable and tough to handle great speed, rough terrain and all other obstacles that come with the racing tracks. If you live in a rural area or any place where you need to do a lot of off-roading, this is a set you could use. The one we chose has 25×8-12 Front tire & 25×10-12 Rear tire size. However, if it does not fit your ATV, you will find many other sizes available. These tires are made with a non-directional tread pattern that allows you to use it on very rough and uneven terrains. Particularly suitable for trails, this tires handles races, sand, mud, dirt, and rock without any trouble. Moreover, these tires cannot just handle aggressive terrains but also have an aggressive construction. They are Bias in construction and have angled knobby tread to handle harsh conditions. Moreover, with a 6-ply rating, it assures you of durability. However, it is not only durable itself but also keeps your wheels durable. Its lugs are made large to protect your rim and sidewall from wearing out. Moreover, the lugs have a depth that provides you with better control. So, you can use it for anything from lawn-mowing, golf, to races. This is one of cheapest ATV tires out there offering great value to users. With a dimension of 25X8.00-12 and a 6 plywood rating, this tire will not fail you on uneven ground. In fact, it will give you the best experience in any weather as it is great at handling low temperatures. Be it snowy or muddy, these tire with aggressive tread patterns, angled knobs, and center lugs will give you complete control and grip on uneven terrain. However, it won’t give you the best smooth-road experience. Moreover, it protects your rim with a rim guard and is also very durable itself. This another Bias tire that excels in the purpose it serves. In fact, it is a mud-terrain tire that you can use in your lawnmower, garden tractor, side by side vehicles, fun-karts or racing scooter. Its multidirectional tread pattern gives you adequate control over your vehicle. The grooves in it make your ride smooth on any surface. The 2 or 4 ply rating makes the tires quite durable for the work it has at hand. Moreover, its ability to avoid mud accumulation in it also improves its durability. Lastly, it has a rim diameter of 8 inches and 0.68 inches tread. These are aggressive and tough tires you can use on almost any terrain. 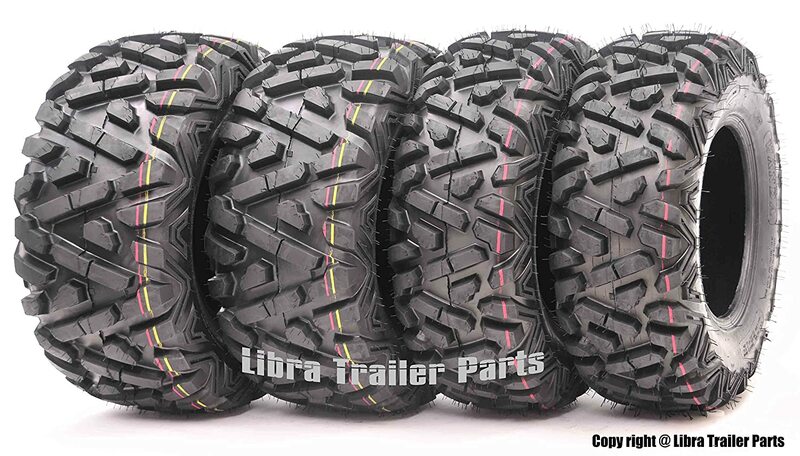 In fact, these tires perform really well on sand, mud, snow, dirt, rock, etc. Moreover, it has a great tread depth of 0.79 inches which is greater than the 0.5 inches offered by other companies. And, greater the tread depth, the greater steering control you have. Also, their wide contact will provide you with greater acceleration. And, this tire promises to stay with you as long as possible. They are quite durable with not only a 6 ply rating of nylon construction but also shoulder lugs that protect the rim and sidewall. So, with a size of 25×8-12 Front & 25×10-12 Rear tires, this tire provides you with top-notch experience and durability. With these tires you will have one less worry- A mud terrain getting you stuck. As the name suggests, these are mud-terrain tires and you can use it without a worry in both mud and sandy terrains. The tread pattern is large provides you with better control in the mentioned terrains and also on pebbly, gravel terrains. Apart from that, the tread design and size also helps to push the mud away. Moreover, this mud terrain tire makes less noise than most other tires of its kind. It can easily bring you out of mud and sand. As a cherry on top, it will give you a smooth and comfortable ride with its center treads. You do not have to worry about it tearing up after so much aggressive handling. Because it has a 6 ply rating which allows it to be resistant to puncture and tears. Lastly, it has a size of 25 X 08-12. How do I know if the tire will fit my ATV? Answer: Most tires are available in various sizes. In case they are not, the company always mentions the one size they are available in. So, first measure your rim size/diameter then check if the mentioned size of the tire will fit your ATV. Answer: Yes, all the tires mentioned here are tubeless. ATVs are quite an investment and their most important parts, the tires, are one too. Moreover, they are an integral part of everyday life as well. An integral part malfunctioning may frustrate you. Therefore, to make the best use of your valuable money and that magnificent ATV, choose your ATV tires carefully. Efficient and effective ATV tires are the key to improved ATV performance and life. Our guide and reviews for the best ATV tires should help you choose one for yourself and live a fun life. So, with our tasks accomplished, it is time for us to say goodbye and good luck to you! When it comes to brakes, you can choose between a centerlock or a 6 bolt. While there are other types, they are uncommon. The rotor that comes in contact with the brake pads are the same, but how they connect to the hub is different. You should choose your disc brake based on the purpose and terrain you plan on riding on. We’ll help you understand the advantages and disadvantages of both so that you can make rational purchasing decision. What is a Centerlock Brake? Centerlock rotors are more error proof and easier to install than 6 bolt rotors. Since there is only one lock in the middle, you don’t have to waste time trying to torque the 6 bolts evenly onto the bike rotor. Besides, they weigh less than 6-bolt brakes. Thus, making them a great choice for professional bikers who want to have a lightweight bike for their races. As a result, users experience faster speeds and braking times due to its lightweight size. However, centerlock rotors are usually more expensive. This is because there is an aluminum center for the hub attachment and a steel center for the rotor’s working end. Make sure that you do your market research before buying centerlock brakes as they can be harder to find than traditional 6 bolt brakes. What is a 6 Bolt Brake? 6 Bolt motors are the more traditional form of bike brakes as manufacturers started producing them in the late 1900s. Their main advantage is that 6 bolt brakes account for 90% of the brakes available in the market. You don’t need a special key to use a 6 bolt. All is required is a Torx driver (which can be found in most pocket tool sets). Most high quality 6 bolt rotors also have a 2 piece section. Two-piece rotors have more stability, warping resistant, and have a high heat resistance. The only disadvantage with 6 bolt brakes is their installation. You have to use a torque and apply them in a star pattern or else you’ll run the risk of having an uneven brake. Fortunately, manufacturers give important data on the force needed to tighten the bolts. Another important thing you have to remember is the rotor diameter. It’s located in your bike’s brake specs or is printed on the back of your existing bike rotors. For most bikers reading this, you’ll have either a 140 or 160mm rotors. Mountain bikers have a rotor diameter of 180. On rare occasions, some riders tend to have a bike rotor size of 220. However, this is usually for extreme downhill racing on steep terrain, and you need additional braking performance. In the end, it’s up to you to decide which one is the most beneficial (both design advantages and flaws). We suggest using the Centerlock brake if you’re a novice that’s starting from scratch. If you want a more authentic bike, then the 6 bolt brake is the best way to go. What do you think is good an bad with each rotor brake design? Don’t underestimate the value of having good motorcycle tires. They are the only contact with the road. Most expensive tires will last longer and fit better than inexpensive ones. Plus the rides will be better because of the superior compounds in the motorbike’s tread. When inspecting your tires, look for small punctures within the motorcycle thread. Pieces of grit and tiny shards can embed themselves and work their way to the tube of the tire. To fix this, you can use a penknife to remove the shards from your motorbike carefully. Having good road tires ensures that you’ll remain safe when traveling on your motorcycle. Having a motorbike with too much PSI can cause you to go off balance easily. Check the recommended bike pressure of your tires to enhance their performance and remain safe while on the road. Fortunately, this guide will find the best tires related to the KLR 650. That being said, let’s start the review! Up next is the Kenda Taskmaster II. One thing that makes these tires stand out is that they are DOT approved. This means that they are legally certified and are safe to use for bikers of all skill levels. It’s currently sold on Amazon at a price around $50. The tires have good handling but don’t use them on the pavement because their knobs will burn down. On the other hand, use them off the road, and you’ll have no problem cutting through corners and being able to navigate through the course. The only disadvantage is that they don’t have the same quality as more expensive tires placed on this list. But, it’s inexpensive price is it easier for you to replace it. 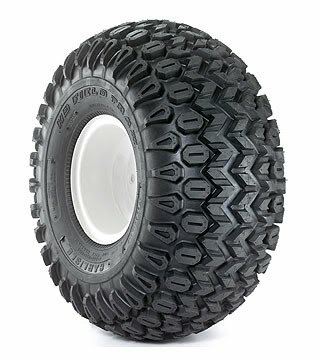 Get this pair of tires if you want something that’s compatible in most off-road environments and is at an acceptable price range. Michelin Commander is another great pair of tires that comes at an affordable price. They are known for having high-quality knobs within the well-rounded knobs placed on the side; meaning that its great for street handling. It’s now on Amazon at a price about $110. Also, the wheels are good for driving off roads. For example, it’s known for doing well when handling sand, a skill that most dual sports tires tend to forget. We recommend using these wheels for added support for daily riding and increased function usage. But, their main issue is its stiff composition. This makes it harder for users to mount them correctly on their rims. We recommend that you take your time when installing the tires and you’ll install them properly. For its price, the Michelin Commander is a versatile pair of tires for most sporting activities. They/ have a reputation for lasting at least 5 years before recording and needing repairs. Buy this product if you want an all-purpose set of wheels that will help both casual and professional riders. The gripsters are perfect for motorcyclists who want extra traction. If you’re planning on riding on tough surfaces, you’ll want sticky tires that can keep you stabilized. They are also good on wet surfaces as well. Buy it on Amazon today at a price around $40. While they are more expensive than cheaper tires manufactured in Asia, they are known for their enhanced durability. They also tend to last for a long time; meaning that you don’t have to replace them in between professional races or casual riding constantly. However, don’t place them in an intense off-road environment, as they’ll tend to slip off course. The Avon Gripsters are a great choice for a beginner rider who wants an all-purpose tire for daily usage. If you want the best set of tires, we suggest buying the Kenda Taskmaster II. Not only do they have great traction when riding on off-road terrain. Also, they are DOT certified, making them safe to use. Try this set of wheels if you want to ride without worrying about the pressure rating while also having enough performance to ride on almost any terrain. Which KLR 650 tires do you recommend? Just like a car, you have to get the right bike tires to improve its overall performance. The tires you choose will depend on the tracks you plan on riding and how you are going to use the bike. For simple mountain biking, you should get tires that are thin and have fewer knobs because they can also work on rough terrain such as dirt trails. Here, we’ll explain how 29er road tires are becoming penetrating the cycling market and how they can increase your efficiency when on the road. What is a 29er Road Tire? As its name suggests, a 29er tire is a bike tire that has a 29” diameter. Traditionally, bikers tend to use 26” tires, but the increased size of a 29” bike has made them the preferred choice amongst professional bikers. Despite receiving opposing thoughts from skeptics, 29er tires are increasing in popularity. Every year we’ll see them on the trail and on the market. World class racers are winning with these tires and UK and US manufacturers are selling out of them. Perhaps its time to notice them. There are some misunderstandings of traction when comparing the 29er tires to 26ers. If a rider sits on a 26er and 29er tire with equal tire pressure, the length that the tire comes in contact with the ground will be the same. But with tires of the same tread and brand, the differences between shape and volume will make a wider contact path for the 29er. Thus, making it easier to gain better traction using the 29er on your mountain bike. Who Can Benefit From 29ers? With high-end companies experimenting on larger wheels on multiple downhill bikes and an increased amount of cross-country bikers using them, people tend to wonder are 29ers more efficient than 26ers for riders? Riders who like the 29ers ability to create a softer roll over rough terrain will go faster. But for riders who worry about the slight gap in acceleration might go slower. Technically, it’s a more of a preference option than a direct speed benefit. For larger riders over 5’6” tall, you should get a 29er tire. In fact, 6” riders can enjoy 29ers more because they allow them to ride in a natural position. However, if you’re under 5’6” tall, you should opt for a 26er tire to support your riding position. “29ers offer some direct advantages, but they also face challenges regarding fork, frame, and its component design. It’s larger diameter increases its mass, inertia wheel flex, and longer and flexible bike tubes. Recent inventions such as through-axle dropouts, and wider lightweight rims play an important part of stabilizing the playing field. If we’re going take notice of possible drawbacks 29er road tires, we might as well exploit their advantages. If we do that, we’ll start to see an increase in their popularity” – James Huang, Technical Editor of Bike Radar. This means that we have a long way to go before we start to see 29ers become the standard cycling tire. While some traditional riders tend to use 26ers, the obvious benefits of 29ers (larger diameter, better traction, increased stability) can’t be ignored. To conclude, you should consider using a 29er road tire on your next biking adventure. They allow you to accelerate faster on cross-country trails while having enough width to keep your bike stabilized during high speeds. Ultimately, try them if you’re willing to increase your performance and become a more effective biker. Copyright text 2017 by EVERTIRES.COM.